Café Rebelde supports the Zapatista communities in the Chiapas region of Mexico. Ruth Strange from the Ethical Consumer spoke to Jaspa Beese of the Essential Trading Co-operative in Bristol about how Café Rebelde came to the UK. 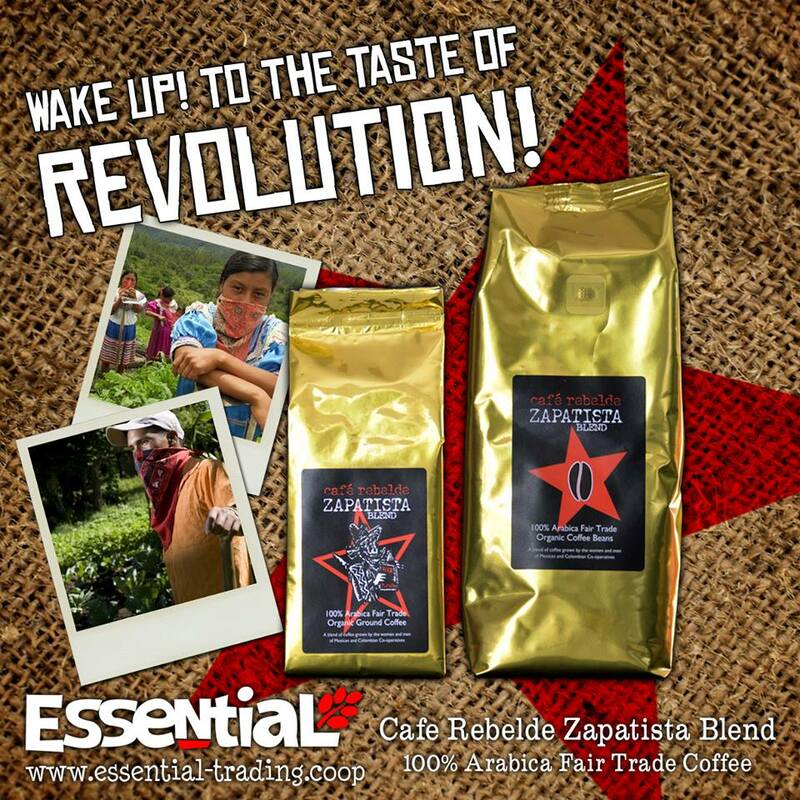 Cafe Rebelde, or Zapatista coffee, supports the Zapatista communities in the Chiapas region of Mexico. The Zapatistas came to world attention in 1994 with their uprising against hundreds of years of poverty, discrimination and repression of indigenous communities since the Spanish conquest. 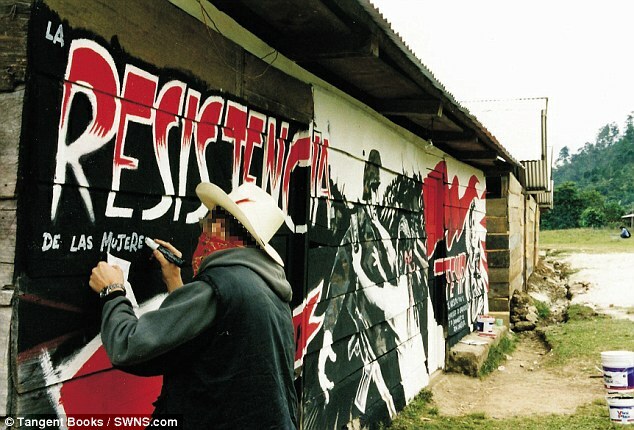 The uprising coincided with the launch of NAFTA, the North American Free Trade Agreement, which Zapatista spokesman Marcos proclaimed a “death certificate” for indigenous farmers. The Zapatista emphasis on autonomous organisation rather than seizing power over others, has inspired movements around the world. 20 years on and they still self-govern their communities across five regions of Chiapas. According to an Al Jazeera article on the 20th anniversary of the uprising, the Zapatistas had a strong influence on the Occupy movement, as well as the Spanish ‘indignados’ and Greece’s ‘Direct Democracy Now!’. We spoke to Jaspa from Essential wholesalers in Bristol, about how Cafe Rebelde came to the UK. How did Essential come to be a distributor of Zapatista coffee? It started in 1999. Bristol has a sports and social club called the Easton Cowboys, and one of the football teams went to play a tournament in Chiapas. We knew some peace observers working there who suggested it. So we took about 30 people for a 3 week tour of the autonomous zones. So we met the Cafe Libertad Kollectiv in Hamburg who were already importing it to Europe. 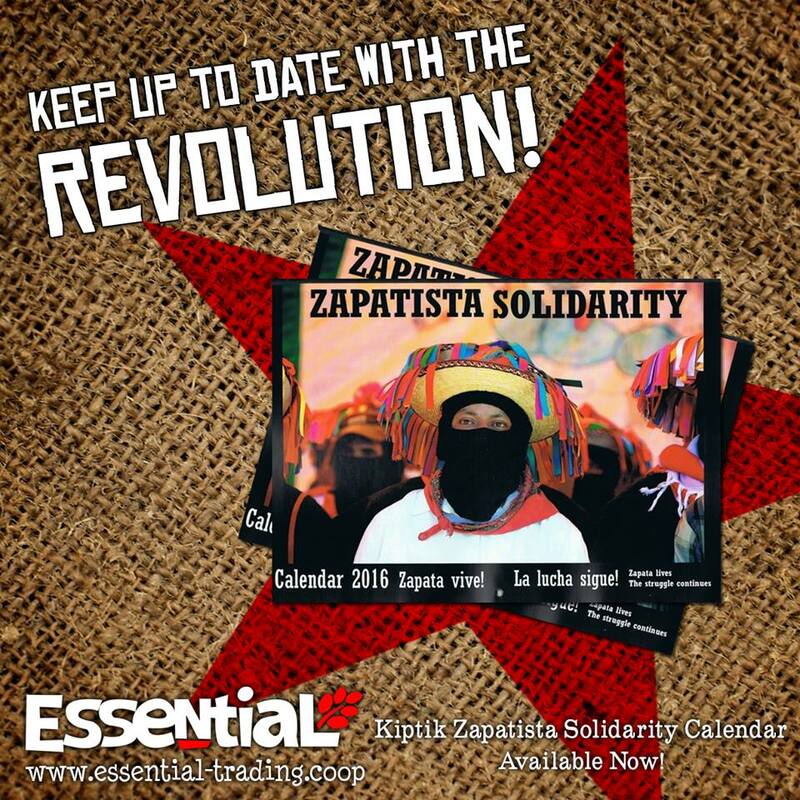 Now we’ve been distributing it for 8-9 years, and for every kilo of Zapatista coffee sold by Essential, we donate .45euros to Kiptik, which works out about £350/month. How does this initiative fit with the ethos of your cooperative? Essential Trading is a worker’s coop and has a policy to do business with other co-ops. The way the Zapatistas are organised reflects the way we are organised, with sectors, or working groups for different areas, who send delegates to meetings of the whole organisation. What is the situation for the coffee growers in Chiapas? When we first visited, we were surprised to see that although 40% of the communities had no electricity or clean water, they all had a concrete basketball court. Then we found out that’s where they lay the coffee beans out to dry. I did do a day picking coffee, one of the hardest days’ work of my life… It’s grown under shade and so you’re crouching down all day, and only picking the ripe berries. They’re carrying 50kg sacks halfway up a mountain…. Previously they would sell to ‘coyotes’, middlemen who sometimes didn’t pay up, or gave them a bad deal because they were desperate. Now they get paid 50% upfront by Cafe Libertad, and it’s a price above fair trade. Unfortunately they are facing a serious problem with ‘coffee rust’. Part of the reason is global warming. Because the coffee is grown organically they can’t treat it with chemicals, and are having to move the plants up the mountain. But then it can take 2-3 years for them to fruit properly again. So now the Zapatista coffee is mixed 50/50 with coffee from the Juan Tama women’s coop in Colombia, to try to stretch out the supply. So how else do you support the work in Chiapas? And for the final word, can we quote from your website? The fungus which is destroying coffee plantations in Chiapas allows the multinational to change the cultivation of coffee according to its own interests. In nine municipalities in Chiapas, the outbreak of rust affects between 20% and 62.7% of the coffee. 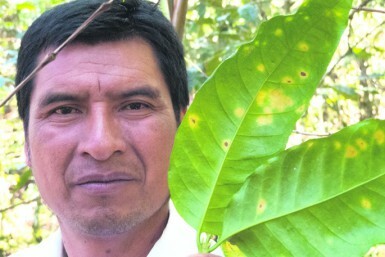 MEXICO // Antonio López Jiménez gently picks a leaf from his coffee bush, now almost leafless. “This is the rust,” he laments, showing yellow spots on the surface of the plant. Until November 2013, Antonio’s main concern was to find coffee buyers who would allow him to avoid the middlemen, and thus charge a better price for his product. Today all this has changed for the indigenous Maya from Mexico, whose biggest nightmare is the orange leaf rust, a fungus that has eaten 80% of the plantation of Arabica coffee planted by the cooperative he founded with 200 other families in 2010. The invasion of this fungus is a real threat to the local economy in Chiapas, one of the poorest regions of the country. 88% of the population lives in poverty, so the sale of coffee is a vital source of income for survival. Since 2011, the price of arabica beans has fallen by nearly 60%, and the three million farmers who live by growing coffee fear for their future. Moreover, without money, the coffee growers are barely able to invest in the maintenance of their plantations, which favours the spread of the epidemic. Another of the problems that Mexican campesinos are facing in combating orange leaf rust is the lack of a means to put an end to it: a variety of arabica which is resistant to the fungus in one ecosystem will not necessarily be so in another. According to figures from the National Coordinator of Mexico Coffee Organizations (CNOC), 50% of coffee plantations in Chiapas are affected by orange leaf rust. Something similar has occurred in other Mexican states such as Veracruz and Oaxaca, where regional authorities have called on the federal government to declare an emergency. But the Mexican president denies that there is a plague. “The rust problem affects 10% of the coffee. There is no epidemic or emergency” says Belisario Dominguez, director of the Ministry of Agriculture. An assertion that contradicts data from the National Health Service, Food Safety and Quality (SENASICA), which holds that leaf rust is “the most destructive disease of coffee.” According to this institution, in nine municipalities in Chiapas fungus affects 20% to 62.7% of the coffee. And in Veracruz, 18.7% of the plants are contaminated. And this is where the controversy arises, because not everyone loses from the invasion of orange leaf rust. The government inertia leads to producers and local institutions allying with companies like Nestlé. The Swiss multinational is handing out plants and chemicals in Veracruz to combat the epidemic and will soon begin operating in the State of Guerrero. Nestlé distributes coffee of the variety catimor, which supposedly resists rust. 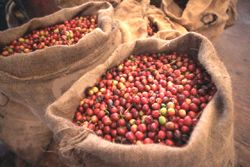 Since 2010, through Plan Nescafé, the food company also distributes a species of coffee plants known as robusta. It is a low-quality coffee bean, which, unlike arabica, will also grow at below 1,000 meters above sea level. This product is used to make instant coffee and is resistant to rust. “In some areas where both varieties can be produced, farmers have endeavoured to replace the arabica coffee bushes with robusta. And this has been due to the rust,” explains Emilio Diaz, responsible for supplying coffee to Nestlé. This substitution of crops is good news for the Swiss company, which owns the world’s largest processing plant for soluble coffee, in Mexico. 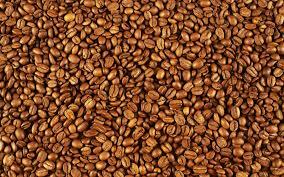 Due to the low volume of production of robusta beans on Mexican soil, the multinational has to import this coffee from abroad, with the costs that this represents. So five years ago they launched Plan Nescafé. “Thanks to this strategy, in 2020 we could put an end to imports and become self-sufficient in robusta beans within five years,” says Diaz. But this agreement is not being fulfilled. Despite its commitments and declarations, the Government of Mexico is actively participating in Plan Nescafé and even economically supports the producers of robusta through the Humid Tropics programme. This plan gives about 300 euros per hectare to farmers who cultivate this type of bean [robusta], while the campesinos growing arabica – 97% of the coffee producers in the country – receive only 79 euros. The third largest coffee producer in the world, Colombia, has not escaped the invasion of leaf rust. The Coffee region, in the north of the country, recorded a fungus outbreak in 2008. 55.3% of the area used for agriculture is occupied by coffee plants, so the problem was serious. That same year, the government began a process of renovation of coffee plantations, including the planting of 50,000 hectares of young plants and arabica varieties resistant to the fungus. “In Colombia, the government and companies responded to the epidemic by investing in research. They also enabled the coffee producers to access credits and incentives,” explains Antoine Libert, of the Autonomous Metropolitan University (UAM) in Xochimilco, Mexico City. This alliance between government and business, where the support of the Executive to the agricultural sector has been very prompt, does not exist in the Mexican country. “There are government departments and offices engaged in agriculture, but they are doing so independently and in isolation. There is little coordination in this area within the public sector,” lamented the expert. In 1867, farmers in Ceylon saw a previously unknown fungus completely wipe out their plantations. It was the Hemileia vastatrix, the scientific name for leaf rust, which now threatens the coffee plantations of half the world. After the voracious fungus attack, farmers in the British colony had to replace their battered coffee plants with tea plantations, and soon the island became the world’s leading exporter of tea. But leaf rust had already begun spreading unstoppably. The fungus spread through Southeast Asia, and from there to Oceania and Africa. A century later, in 1970, it reached Latin America through Brazil. In 1981, the coffee plantations in Mexico were already infected by the plague. Since then, the rust has been taking over the American coffee ecosystem. Abnormal conditions of humidity and temperature, as a result of climate change, have helped spread what is now already a real epidemic. 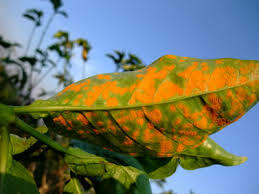 The origin of the current outbreak of leaf rust was in Guatemala in 2010. In this small Central American country, the fungus has wiped out 70% of the coffee crop. Peru and the Dominican Republic have also not been spared its destructive effects. In Mexico, the small-scale producer of coffee tied to traditional and organic farming, are fighting a battle against two large multinational companies: the Swiss Nestlé, a global leader in the food industry and Agroindustrias Unidas de México (AMSA), which controls about 50% of exports of the country. Nestlé has acquired a patent on a genetically improved plant that facilitates the solubility of the coffee powder. Thanks to this license, the company will not only expand its control over the coffee producers, but will also increase the risk of genetic contamination on the organic plantations, of which Mexico is the first manufacturer in the world. The granted patent poses a serious threat to the economy of more than 480,000 farming families and about 500 rural and indigenous organizations that are depending on the coffee. CESMACH puts together 491 affiliates in 32 different rural communities of Chiapas, which means lives of nearly 500 families depending on their work. CESMACH farmers, facing lots of difficulties, carry forward organic farming, abiding to a strict set of rules meant to protect the fragile environment of the biosphere. In agreement with the Mexican government and AMSA, Nestlé has invested over the past five years 600 million dollars in Mexico, where several areas intended use is coffee production: e.g. Veracruz, the mountains of the state of Oaxaca and Chiapas, where the altitudes and a mild climate provide ideal conditions for the coffee production. The dual plagues of blight and price fixing are causing the scarcity and high prices of the fragrant bean, but the real problem for communities is the need to grow other foods. During the months of January and February 2014, coffee prices rose in Chiapas. One explanation was coffee rust, a fungus that infects coffee trees. However, as local experts explain, there are many factors working together to turn production into a crisis. “There’s not far to go until the situation becomes explosive,” explains Javier Galván, member of the coffee network of the National Union of Regional Autonomous Rural Farmworker Organizations (UNORCA, in Spanish). Scarcity and price increases will directly affect many families, for whom it is their only source of income. “This will become chaos, there will be a lack of food and people will begin to migrate to large industrial cities, to Cancún, to other countries. We won’t have any other option,” laments Gómez Álvarez. Other problems pushing prices up are sales and price fixing. Those that are organized in cooperatives are better able to resist this, but that depends on the organization, explains Jorge Santiago. The state wants “control over economic matters and there are cooperatives that are deciding to close down.” Santiago explains that the new tax laws, corruption, and a lack of corn are suffocating rural Chiapas farmers. The International Coffee Organization declared recently that the price of coffee had risen so dramatically because of a reduction in production in Brazil, due to lack of rain. However, in the state of Chiapas, “the problem now is that there is no coffee because of the rust,” Galván explains. Santiago explains that this situation is permanent. “Coffee is just one more component of the food crisis,” because if the small-scale producers lose production areas they lose everything, and the large corporations or plantations only lose a small percentage, he adds. The rust blight is expanding to Oaxaca and Veracruz, says the UNORCA representative, and there are additional breakouts being reported in Colima and Nayarit. Organizations of coffee growers asked the Secretary of Agriculture, Livestock, Rural Development, Fishing and Nutrition (SAGARPA, in Spanish) to declare an emergency, but this has not yet happened. “We warned them that the blight could turn into a very serious problem, and now we have that problem,” Galván points out. Coffee price increases have already begun to lead to grassroots mobilization. 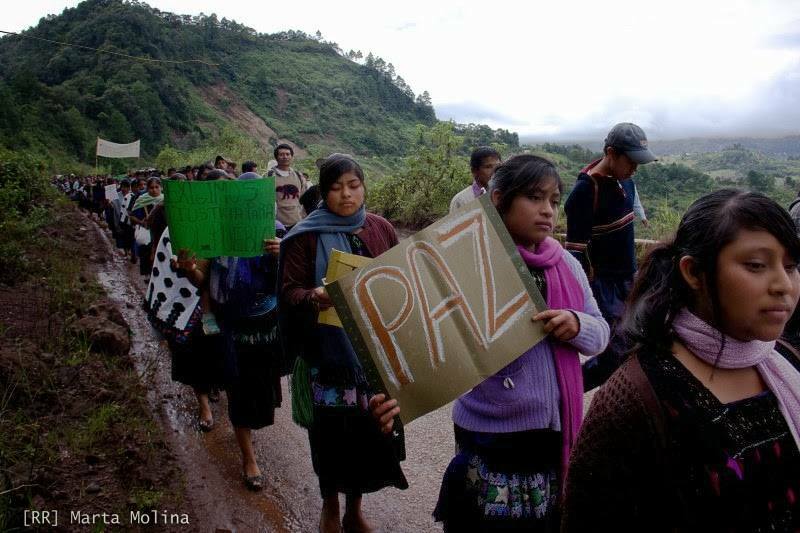 In Chiapas, more than 8,000 people organized across the Coast, Mountain, and Soconusco regions. In the Concordia region they have also taken control of the highways. The Fray Bartolomé de Las Casas Human Rights Centre is very concerned about the situation of forced displacement of 17 families (currently 100 people) from ejido Puebla, municipality of Chenalhó, Chiapas, who are returning to their land plots from the 17th to the 27th January 2014 in order to carry out the coffee harvest; the group will be accompanied by representatives of national and international civil society organizations and human rights defenders, in an action of inter-agency coordination with bodies of the state and federal government, who have said they will guarantee conditions of security and personal integrity for the displaced families and human rights observers. The 10-day stay of the displaced people, who are going to harvest their coffee crop, their main means of subsistence, is a civil and peaceful action whose main demand is that the state authorities immediately guarantee the necessary conditions for their permanent return, along with the restitution of their individual and collective rights, of which they have been arbitrarily deprived. – Protect the life, integrity and personal safety of the 17 families who will be returning, and of the human rights observers who will be accompanying them in the ejido Puebla, municipality of Chenalhó, Chiapas. – Ensure the necessary conditions in order to guarantee that a short period of 10 days of harvesting the coffee will lead to the final return of the displaced families. Summary of this report about “Plan-Nescafé”, the latest project from their “Creating Shared Value” programme. The plan says it aims to improve Nestlé’s access to raw materials and offer income security to coffee producing families while simultaneously respecting the environment. However, instead of creating shared value, Nestlé has consolidated its market concentration and its control over the production chain, and benefited from government subsidies – thanks to client relationships with the world of politics – which previously most benefited Fair Trade cooperatives. And with intelligent marketing strategies, the company has achieved that in Mexico, Nescafé, made from cheap imported grains, continues to dominate the market and prevent local good quality coffee from being introduced broadly into consumer habits. Many coffee families are disillusioned. The apparent change of course towards a fairer form of production turns out to be just another campaign rebranding.